Key Difference: Arthritis is an umbrella term covering more than hundred musculoskeletal disorders. Gout is a form of inflammatory arthritis which causes sudden severe attack of pain, swelling and tenderness. The term Arthritis refers to inflammation of the joints. It is an umbrella terms that covers more than 200 kinds of rheumatic diseases or conditions. 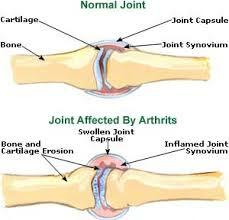 Osteoarthritis and rheumatoid arthritis are two most common types of arthritis. Arthritis is often recognized by its two main symptoms which are joint pain and stiffness. The different types of arthritis are actually caused by different reasons. For example, it can be caused by uric acid crystals, infections, etc. As the type of arthritis depends upon its cause, therefore the treatment also varies according to the type of arthritis. It results into problems like pain, stiffness, inflammation and damage to joint cartilage and surrounding structures. Many people consider that it is resulted due to ageing; however, it has been proved that it is not a natural part of the ageing process. It is not yet curable. Thus, its treatment is related to reducing the symptoms of arthritis. Gout is often referred to be the other word for Arthritis. However, it is a form of Arthritis. It is recognized by symptoms like sever pain, redness, warmth, and swelling in some joints. It mostly affects the large toe. 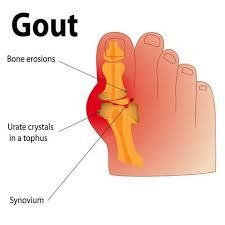 Gout occurs due to the accumulation of uric acid in the blood. In case the production of uric acid gets higher than the levels of its excretion then tiny crystals are formed in and around joints. These crystals are hard and needle shaped. This accumulation or buildup of crystals takes up a lot of years to spread. A person, who is older, obese, has high blood pressure or diabetes, drinks too much beer, etc, is considered to be more prone towards the condition. Thus, Gout is just a form of Arthritis caused by build-up of uric acid in blood. Sudden, intense joint pain, which often can wake a person from sleep. Swollen joint that is warm to touch. Red or purple skin around the joint. From Old French goute, from medieval Latin gutta, literally ‘drop’ (because gout was believed to be caused by the dropping of diseased matter from the blood into the joints). Hyperuricemia, which leads to the deposition of monosodium urate crystals in tissue.